Having set a target of one million people taking part in their running events by 2020, Great Run organisers Nova International have today launched the Morrisons Great Newham London Run, with Great Run founder Brendan Foster unveiling a vision for it to become the UK’s biggest mass participation running event. 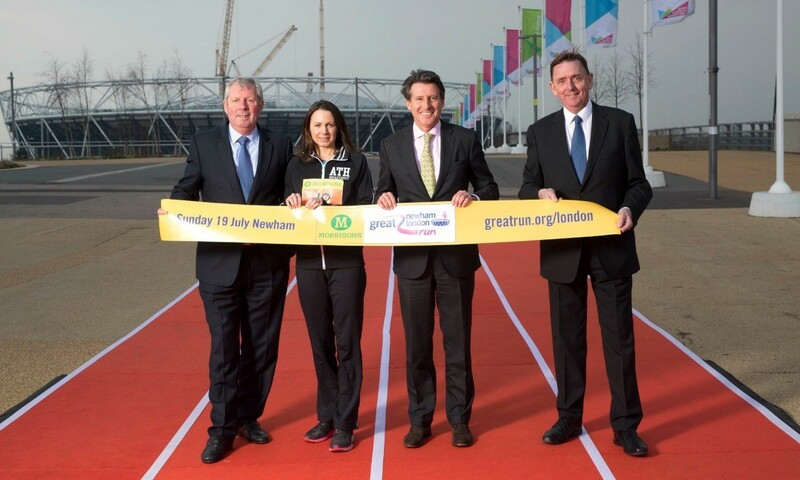 Foster was joined at the Queen Elizabeth Olympic Park by the Mayor of Newham, Sir Robin Wales, together with Sebastian Coe and Jo Pavey to launch this year’s Great Newham London Run, set to take place on July 19 as the first event in the former Olympic Stadium since redevelopment work began. In comparison, Nova’s Great North Run is currently the biggest annual running event in Britain with 57,000 participants. More than 220,000 people took part in the Nova International-organised series of events in 2014. Former LOCOG chairman Coe, who is currently running for IAAF presidency, believes the event to be an exciting part of the London Olympic legacy. “The Morrisons Great Newham London Run is a tremendous example of London 2012 legacy in action,” he said. “It is a unique opportunity for runners of all abilities to experience running in the former Olympic Stadium, which no other mass participation event offers. The stadium in the Queen Elizabeth Olympic Park is currently undergoing redevelopment work to turn it into the new national competition centre for British Athletics in 2016 as well as the permanent home of West Ham United Football Club. As well as the 10km event set to take place there this year, the Morrisons Great Newham London Run is also due to include a 2km family run and a team relay event which will involve four 10.54km stages totalling the marathon distance. Entry into the 10km event costs £32, with further details available at www.greatrun.org.